I have been traveling around the US again this month and during that time I’ve been able to check several more places off of my Sacred Spaces Bucket List. I have been busy with so many other activities during these travels that I haven’t had time to stop and write much. But as I go, I promise to record my thoughts and experiences in these places even if it comes a couple weeks later. The experiences that I am blessed to have in these spaces stay with me and travel with me, so I will be sharing them with you as soon as I can. They have been, in fact, the necessary pause in the midst of the nonstop activity of a whirlwind road trip. 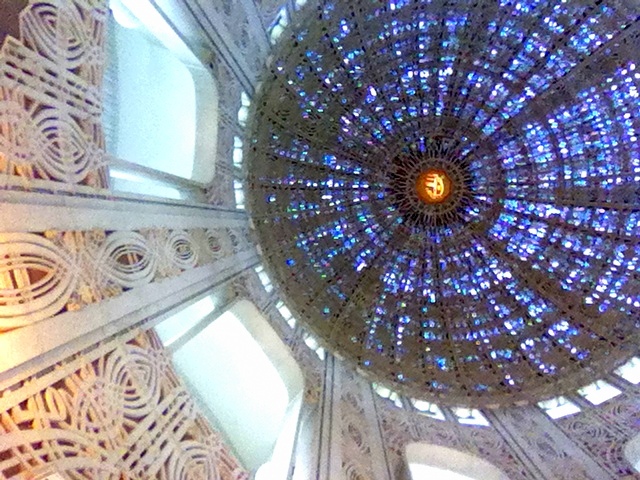 No place better embodies this sense of pause than the first sacred space on my current trip, the Baha’i Faith Temple in Wilmette, Illinois. This temple in Wilmette is one of only eight Baha’i temples in the world, representing the central symbol of light and unity for all who follow the Baha’i faith in all of North America. This is why I absolutely had to see it while I was in the area. As someone who seeks to understand and learn as much as possible about all world religions, I have opportunities in every city that I visit to see churches or mosques or synagogues or temples from other religions, but Baha’i only gives you eight chances in the world, so I had to take the chance when I got it. 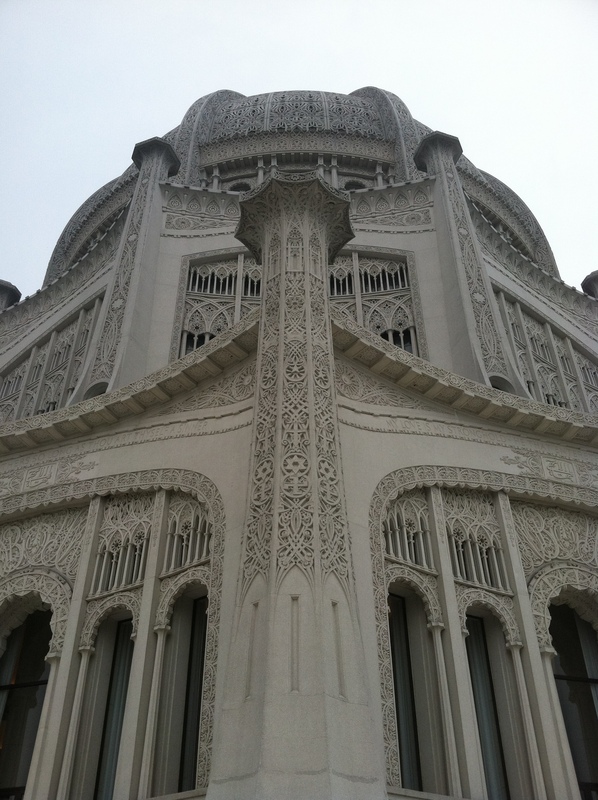 I will admit, however, that I knew very little about the Baha’i belief system before visiting Wilmette. I had known a few people who had dabbled in it and even had a couple of my roommates in Haiti who briefly converted to a local version of Baha’i a few years back. But that didn’t last long as I always suspected that they were just doing it because of a couple of cute girls who were also in the group that they wanted to impress. “Hey Girl, yah I totally believe in the oneness of humanity and dignity of every human being. What you doing later?” So despite their weekly devotional meetings, they were never great wells of information for me to learn from. So I approached the temple with a significant level of ignorance but also a significant desire to replace that ignorance with understanding. Once I arrived and spoke with some of the individuals there and spent some time absorbing the clarity that the space there offers, I have to admit that what I learned there was in overwhelming harmony with my hippy heart. Central to the Baha’i faith is the belief that we all belong to one human race and that all religions share a common source and aim. They believe that all scriptures throughout history combine to reveal the truth of God and that God himself has used a number of messengers to transmit wisdom to the human race. They believe that civilization is constantly undergoing a spiritual evolution and that Baha’u’llah is the latest of the Divine Messengers to share God’s truth with the world. Basically, in Baha’i, in my very simplified summary, we are all one big happy family. Christians, Muslims, Jews, Hindus, Buddhists, and everyone else. What each believes represents some part of what is True but they each are all just part of something much bigger which they may not recognize themselves. To a traditionally Christian Theist who has always tried to be as inclusive as possible, with a leaning towards pluralism and a desire to find the wisdom present in differing religious traditions, this incredibly encompassing foundation that the Baha’i faith is built upon really made sense. It seemed so refreshing in a world where everyone is always arguing about who’s right and who’s wrong. It seems so refreshing in a world where even people who claim the same labels, claim to follow the same God, and even sit in the same pews next to each other once a week, always seem to end up disagreeing so much on what is truth and what we should do with the truth. The idea that there is a place where everyone is allowed to be some sort of right is refreshing. By entering into this specific space in Wilmette, refreshed is exactly what I felt. As mentioned, that was exactly what I was already searching for after some busy days of fundraising and traveling, a needed an opportunity to pause and refresh my soul. The Baha’i Faith Temple provided just that. From the moment that I stepped in even the welcome center, and not even the sanctuary yet, all of the inertia from my go go going suddenly halted and seemed to fade at the doorway. The simple presence of such a unified, peaceful faith being expressed in a single location, changes the way one breathes, sees, even speaks. When the gentle woman inside greeted me I found myself responding with such a calm moderation in my voice that I surprised even myself. There was suddenly absolutely no reason to speak any other way than with absolute open sincerity. I was tempted to simply stand there and have an entire conversation with this woman about entirely everything that she believed. But that, of course, was not why I was there. I wanted to get into that sacred space where one was invited to encounter the Divine. So after a short chat with her I asked directions into the sanctuary. When you enter into the sanctuary, guests are welcomed and instructed by another compassionate volunteer to maintain silent to respect the sanctity of the space. Walking into the room, which is adorned my a series of tremendously intricate shapes and symbols, just the same as the exterior, all representing different religions and traditions which are all interconnected and all welcomed there, one is immediately filled with the realization that if God were ever going to speak to you, that would be the perfect place to hear Them. In the top of the dome an invocation in Arabic is written, “Oh Glory of the All Glorious”. As you sit in the chairs there and look up through the carvings on the walls, the windows shedding light on every inch of the interior, and ultimately up into the beautiful dome, you are drawn naturally into a meditative state of communion with whatever Spirit you believe in. You are not imposed upon with any doctrine or influenced by any icons, only the whir of the air conditioners to supplement whatever prayerful condition you choose to enter into within yourself. Pause. Refresh. See and Understand. Be. 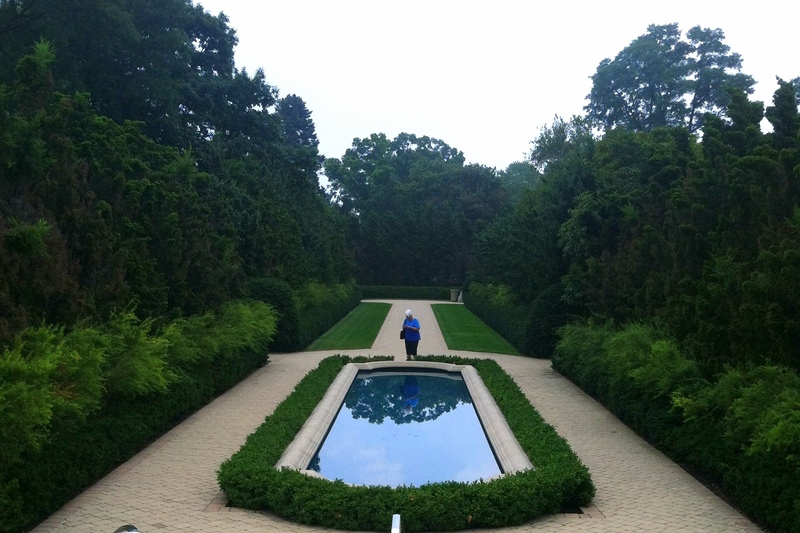 Outside the sanctuary, the space is expertly designed with every inch of the building itself and the gardens and grounds around it to reflect the principles of light, unity, balance, and universal brotherhood. As someone who has lately been fascinated with the artistic and spiritual intersected possibilities of East Asian mandalas, I was naturally inspired by the arrangement of the temple grounds themselves in such a pattern with the temple being at the center of the mandala with gardens and pools radiating out from it. So, before leaving, I had to take the opportunity to walk around the grounds as well in a continued state of prayer. Whatever a particular seeker’s current situation in life, or reasons for searching out an opportunity there to pray, there is place there for them to find the exactly what they need. There is a space to come in contact with the divine direction they crave. So, whatever your spirit craves, whatever commotion is filling your life demanding for pause, if you have the chance while in the Chicago area to stop by the Baha’i Faith Temple, please take it. Whatever God you follow or don’t, I guarantee you will find something in the silence that speaks to you and changes your perspective upon leaving. Praise be. Lee, this is breathtakingly beautiful, thank you for sharing your experience once again with such eloquence and spirit. Indeed, here’s to taking a pause, refreshing, breathing and knowing we are all one. Now I want to go visit this temple too!